Human Resource Management (HRM) as a career option is a popular option for students of management. However, there is a lot of debate whether a man or a woman can be a better human resource manager. The role requires many different people skills and it is often difficult to decide which gender possess more of these qualities. The choice finally depends on these qualities as well as the field in which human resource managers are being hired. 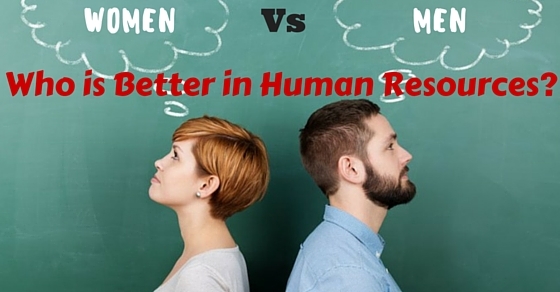 Male dominated professions have greater chances of hiring male human resource managers. Here we have tried to evaluate the qualities possessed by both men and women that may help them in a career in human resource management. With each passing year, more and more women are getting hired as HR Professionals. The reason is simple. The HR profession requires people with good people skills and it is observed that women tend to excel in these skills. Here are some of the positive traits in women that help them excel in this field. This is one of the major attributes of a good HR professional. An HR manager needs to handle the administration, evaluate the performance of a company’s staff and also make sure that their salaries are paid on time. This is something which women are good at as compared to men. They can perform multiple tasks simultaneously. Though some men are indeed multi-tasking, yet all of them do not have the ability to comprehend tasks which are not related to their domain and handle them successfully. Within every organization – irrespective of their size – there are some employees who lack the communication skills that are necessary to interact with their co-workers in order to handle their daily work. Usually, women have better communication skills and are more interactive as compared to their male counterparts. So, they can help staff who lacks good communication skills to help them communicate better with their colleagues and in an effective way. They come up with training programs to help the staff upgrade their existing skills. One forte of any good HR professional is to handle daily work in a highly professional manner. This is because the volume of work that an HR executive has to deal with is significantly higher and complex as compared to their counterparts in other departments within the same company. Women have a complex brain and therefore can maintain their day to day work in a more organized manner as compared to men. Therefore, in HR departments across organizations, women tend to outnumber men. An HR professional needs to understand the business that their company is into and make sure that the well-being of employees is looked into. Any individual who has a deep interest in the industry that he or she is working in can have a good know-how of the problems and issues that may pop up within the organization. Therefore, they can come up with workable solutions to different issues related to the appraisal of employees, the evaluation of their performance and training programs. So, any man or woman may possess this skill. Patience is an important forte of any good human resource professional. The person needs to lend a patient ear to the problems faced by the staff within their company. Though men are known to be more energetic, they usually lack the patience necessary to deal with the issues faced by employees. Women have a better sense of empathy and can help in resolving the issues related to leave, clearing of dues of ex-employees etc. in a better way. Therefore, women as HR professionals are highly trusted by companies across different industries. Any student of management who intends to have a career in HR needs to be people-friendly. A person who is easily approachable, possesses good communication and problem-solving skills is looked upon as an asset in any organization, irrespective of the industry. As in the case of marketing where professionals with a high level of energy and persuasion skills are given precedence, HR as a specific domain needs a candidate to have good communication as well as listening skills and a high level of patience to deal with crisis situations. Female candidates who are people friendly are usually preferred by companies for HR profiles. Unlike other branches of management such as finance and systems, HR involves a high level of involvement with people on a daily basis. A person who is not known to be very social is therefore not fit for the job. A promising career in HR management calls for the need to be social, and be involved in the day to day activities at the office. Ladies usually have a higher involvement within the office and therefore are more suitable candidates for HR profiles. While there are many aspects in women that help them in their career, men also possess some unique traits that help them become good HR professionals. Unlike women who are driven by passion and emotion, men are more practical and rational. This helps them take the right decisions rather than getting emotional. This is also a reason why many firms opt for women over men when the responsibility of a HR manager may affect the functioning of the firm. Conducting interviews and screening of candidates are one of the major responsibilities of HR professionals. Spotting the right talent for the organization requires an HR manager to have the ability to read the body language and expressions apart from communication skills of a candidate. People do not always say what they actually want to, and so an HR person needs to understand what they actually want to say. A candidate’s expressions and body language speaks a lot about his confidence level. Men usually have a good eye for detail related to these areas and are therefore often entrusted with the work of handling interviews. The level of motivation of a company’s workforce depends on their satisfaction level with the work culture prevailing within the office. A proactive HR professional, who is always ready to help others with a smiling face, can in a great way help to resolve the grievances of the staff. Any man or woman can have this attribute, and so one cannot be generalized whether male or female HR managers are good at helping others within their organization. For any HR professional, it’s necessary to be diplomatic with his or her day to day work. The person may not like a particular co-worker, but will be ready to help in resolving any problem faced by that person. Men normally are good at controlling their frustration in a better manner and therefore dominate this profession. Another aspect that is noteworthy about men is that they do not let their frustration or stress control their decisions. They are level headed and have remained in the professional fields successfully. This means that both men and women can handle positions in human resource management effectively if they make sure they handle some of their weaknesses and qualify for the task. If you are still confused whether to take up the profession of a human resource manager, here are some tips to help you. Work on your communication skills. Try to speak effectively and confidently. Revise your language and grammar skills. Get rid of stage fear or fear of communicating with people face to face. Trying to incorporate discipline in your life. It is a great idea to have a place for everything and keep every thing in an organised fashion. Try to improve your time management and multitasking skills as these may come handy when you are a human resource professional. Stay updated with the latest in the industry as it will help you make the right decisions in your career. Try to have a control over your emotions. Do not let them disrupt or influence your professional life. Avoid gossip, bias or partiality. These are traits in women that can harm their career in human resource management. Be patient and control your stress levels. Try to analyse your problems so that you do not let your personal problems affect your professional life. Be passionate about your work and set targets so that you consistently work to attain your goals. Apart from all these things, know your limits. Be it a man or a woman, the body and mind have a certain limit. Do not exert yourself excessively as it will only lower your productivity.